Anyway, we are all so excited to be here with you and tell you a little about ourselves. Cade and I have been married for over 8 years, blogging for 5 and the hubs and I are opposites in the world of desserts. I prefer fruity desserts like, Deep Fried Peaches and Ice Cream, or Raspberry Lemon Meringue Cookies , whereas the hubs prefers Grilled Pizzas with Nutella and Stawberries or this Chili’s Molten Lava Copycat recipe. And strangely enough, both kids would rather have a perfect pepperoni pizza than any dessert at all. Anyway, we obviously really enjoy food at our house (hence a food blog), but we also are suffering through a picky eater. Our littlest happens to be a crazy picky eater. We went through this with her sister too, but thankfully we were able to end it with two methods, the “You choose not to eat, you go hungry” (oh my gosh, I promise we are not mean and do not starve our children, but she seriously could not survive off of cereal anymore! ), and the “you have to try at least one thing” method. Neither of these are working with our second. NEITHER. I want to sit in a corner and scream sometimes. Alright, that may be a tad dramatic. So, we’ve developed new methods with Little Stinker. First, she has to kiss or lick something before she can decide to not eat it. I know that sounds weird, but it’s actually been working. It’s helping her to get used to different tastes and textures. We also make sure that there’s something familiar on her plate every meal, BBQ sauce works well with meats, or broccoli or a fruit. We kind of hide things too, like the cheese on the tortilla. Oh, and the best part? Each family member builds their own salad. Trust me, one of the best things we’ve done to help our little one to eat has been to let her help in the kitchen with me. It’s not always easy, but it’s been totally worth it. Although our first has become a great eater we are still trying to introduce her to new foods, and the second only wants pork (cue the eye roll) but a meal like this is so full of yummy foods that it gets her to “kiss” them, and like I said, every time she does that it makes her more familiar and closer to trying it. The steak looks close enough to pork that with a little sauce we are generally able to get the little one to give it a go. 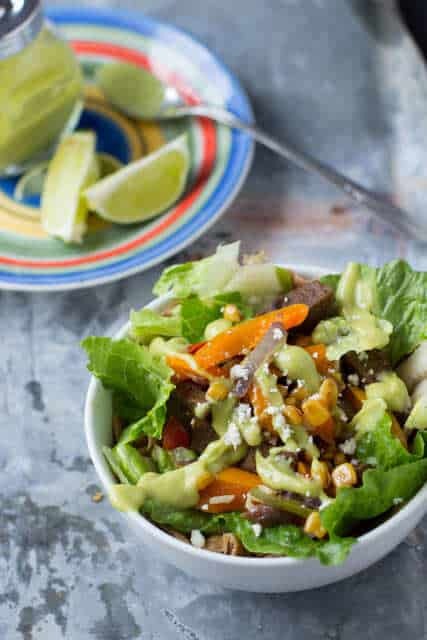 Overall, this steak fajita salad is the type of dish that is yummy for adults, you can easily change of the flavors to your own family’s favorites, and it’s easy for kids to build it themselves and get excited about the foods. And could I just mention that the avocado sauce is amazing? IT’S AMAZING. Truth. Try it on wraps, sandwiches, etc. 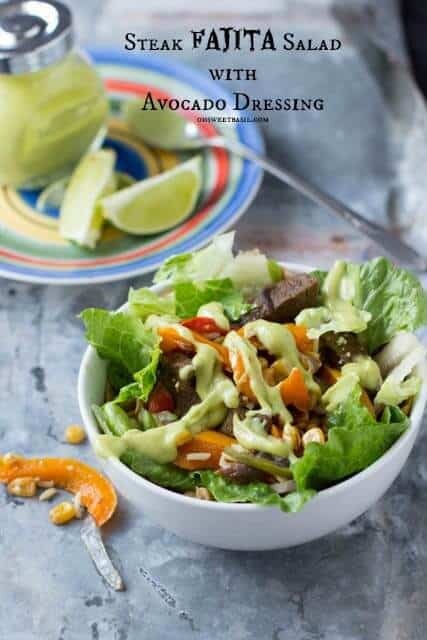 In fact the dressing is adapted from our favorite honey avocado dressing. Anyway, that’s all we have time for today (dude, I totally sound like I should be on a cooking show! Just sayin’, Food Network…), but I truly hope you’ll pop on over and say hello some time!! You can find me on Pinterest, Twitter, Instagram (ohsweetbasil) and Facebook. 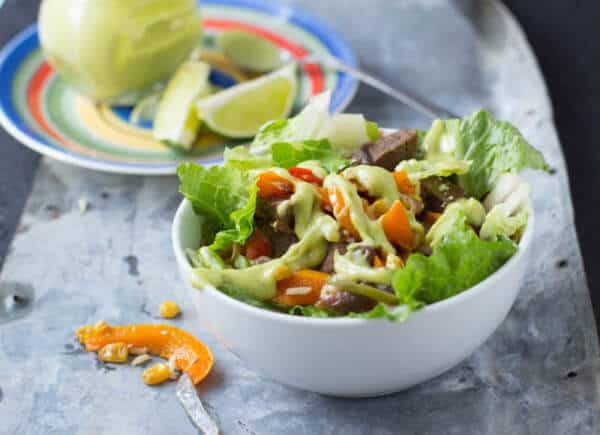 A delicious salad using fresh ingredients and topped with perfect avocado dressing. Heat a grill to medium high heat and sprinkle salt and pepper on each side of the meat. Cook for 6 to 8 minutes per side, remove from the grill and let rest for 2-3 minutes before slicing thin on the diagonal. Meanwhile, in a blender combine all of the dressing ingredients and blend until smooth. Set aside. To assemble: Sprinkle a little cheese on a tortilla and warm in a skillet until the cheese melts. 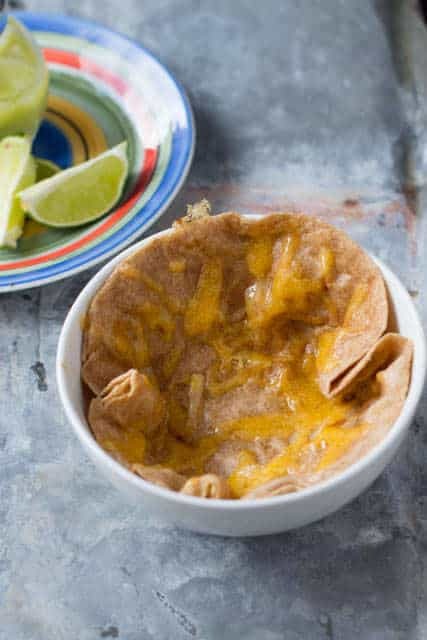 Place the cheese tortilla in a bowl and top with rice, steak, corn, peppers and onions and lettuce. Drizzle with the dressing and enjoy! Oh my gosh, funny story. I came to check out your newest post, saw that colorful plate and though, oooohhh I have that plate too! bahahaha. Well my darlin’ thanks for the guest post. love ya! Bahaha and then you realized that the photography is mind blowing?? 😀 Thanks for the amazing recipe!! Holy Yum! I love steak salads. So healthy, crisp and yummy — especially on this hot Texas day! Great guest post! I absolutely adore Carrian. And this salad is just phenomenal. I can’t resist anything with avocado!
. The service is unique and makes you feel very special. It may take time for the server to get to you, but they put a personal touch to their service. I have a great time there.